Nothing prepared me, a middle-aged American housewife, for life in the magic Kingdom of Saudi Arabia. 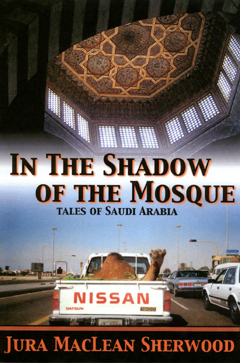 IN THE SHADOW OF THE MOSQUE describes my culturally shocking, mind-broadening experiences, from the mundane to the exhilarating, and the horrific to the hilarious. 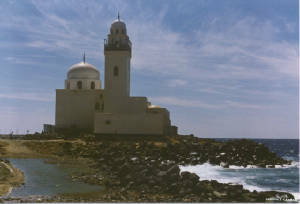 I was fifty-one when, in 1984, I accompanied my husband, an electrical engineer, to Saudi Arabia. On loan from the United States Federal Aviation Administration to a small branch of the United Nations called the International Civil Aviation Organization, (ICAO – pronounced eye-KAY-oh,) his services were contracted to the Saudi Arabian Government. Kindi, a walled compound at the north end of the port city of Jeddah, housed an average of fifty ICAO employees and their families in American mobile homes. From Britain, Europe, North America, Australia, Asia, Africa and the Middle East, Muslim and non-Muslim, we were truly an international community. Islam dictated the rules under which I lived. Forbidden to work or drive a car, I couldn’t leave the confines of the compound alone. Although I didn’t have to cover my hair, I did have to wear a full-length dress with a high neck and long sleeves when I ventured outside the gates of Kindi. With censored newspapers, state controlled television, no cinemas, theaters or libraries, I was forced to entertain myself. I did this by developing a very successful craft business. Because I shopped on the local economy, the market or suq played a large part in my life. IN THE SHADOW OF THE MOSQUE describes the life of a non-Muslim living, for four years, in the cradle of Islam. Waking to what sounded like a barnyard in the middle of a speedway, I gathered my thoughts and tried to remember where I was. I opened my eyes and turned my head on the pillow taking in my surroundings. My husband, Bill, was no longer sleeping beside me and I didn't hear him moving about. I sat up and scooted to the end of the bed to check out the rest of the room. Bright sunlight filtered through the ill-fitting curtain at the single window set high in the wall above the bed. Judging by the amount of grit that had settled in the crevices of the dangling curtain and on the windowsill, neither had been disturbed in a long time. A sudden blasting of an automobile horn and the squealing of tires, the sounds that had originally disturbed me, this time brought me fully awake. Outside a donkey brayed, and at regular intervals a rooster crowed, rounding out the cacophony. I swung my legs over the side of the bed and stood on the grit covered marble floor. So began my first morning in Jeddah, Saudi Arabia. Just a few hours before, Frank, an American with whom my husband would be working, had picked us up at the airport and driven us to Al Attar apartment building. He’d left us at our third floor apartment saying he’d be back in time to drive Bill to the offices of the Saudi Arabian Department of Civil Aviation. I assumed that’s where my husband had gone. I padded out of the bedroom and made my way down a marble-floored hall leading directly to the kitchen. Sun blazed through the solitary window and without a shade or curtain, the glass was too hot to touch. It was October and still only 9 o'clock in the morning. Everything outside was dun colored. Even the sky appeared murky-tan. My view was of a multi-storied, marble clad apartment building separated from Al Attar by a paved two-lane street. To the right squatted a small mud-brick hut with a skinny donkey standing beside it. Splay-legged with his head thrown back exposing large yellow teeth, he noisily sucked in air and emitted it in a horrendous braying. For all his noise he couldn't block out the intermittent crowing of a solitary brown cockerel that shared his arid pen. A crumbling mud wall separated the animal enclosure from a busy intersection — the source of the “speedway.” A constant flow of vehicles, each with the horn blaring, roared up to a four-way intersection. The closest the drivers came to heeding the stop sign was to swerve their vehicle out of each other’s way. In the minutes I stood mesmerized by this display of “chicken,” I saw several near misses. Speeding cars and trucks with horns blasting and tires squealing, came within inches of each other, as they bullied their way through the crossroads and accelerated away as if nothing had happened. Three floors below my window, a small bus pulled into the curb and several Western women in long, loose, colorful dresses emerged from my building. These, I thought, must be my neighbors. I could tell it was very hot outside just by the way one lifted damp hair off her neck, and another fanned her face with her hand, as they filed onto the bus. I left the window, turning my attention to the kitchen and thoughts of breakfast. Our American benefactor had stocked the refrigerator with bread, butter, eggs, milk and orange juice. A jar of instant coffee and a packet of sugar sat on the counter. He’d even thought to provide a bottle of dishwashing liquid and a roll of paper towels. Every newcomer was loaned a ‘survival kit’ to tide them over the several weeks until their household goods arrived from their home country. A pair of sheets, pillows, a well-used blanket and a couple of threadbare towels were piled on the bed when we’d arrived in the early hours of the morning. Bill had obviously found the wobbly frying pan. It sat on the electric stovetop with the remnants of his breakfast egg. He’d also used one of the two plates, a chipped cup and one set of the “silverware.” A round-bottomed saucepan, a spatula with a broken handle and a dull paring knife rounded out our kit. After I’d eaten a scrambled egg with bread and butter washed down with orange juice, I checked out the rest of the apartment. Counting the maid’s room and washroom with a hole-in-the-floor toilet, the place had thirteen rooms. A couple of the bedrooms were bare, the rest of the rooms were sparsely equipped with cheap, gaudy furniture. The whole apartment, including a very large entryway had marble floors. A single bug encrusted bare light bulb, dangling precariously from the ceiling of each room, provided the only source of light. One look told me it would cost a fortune to make the apartment livable and that would be impractical since we only planned to stay in Saudi Arabia for one year. Had I known we’d end up staying for four years I would still not have opted to completely furnish the place. It was obvious from the droppings and the dried body shells that the cockroaches called the apartments home. I was just getting used to the speedway and the farmyard sounds, when I was startled by what I first thought was someone yelling. I then realized the voice came from not just one, but dozens of loudspeakers. Although the voices chanted the same way, they were not in unison but echoed like a roundelay all over the city. I was hearing my first live Islamic prayer-call. Little did I realize we would learn to schedule our lives around the call to prayers five times every day. Not long after I’d heard the midday prayer call, Bill arrived back at the apartment, hot and crumpled. His glazed eyes held an expression of stunned terror, "Crazy bastards," he mumbled. He’d just survived his first driving experience on the streets of Jeddah.